Is your mind like a race track at night going round and round...? Worried too much on your mind ,can't sleep...tired and grumpy the next day? Write down some practical things to do eg call the local gym...schedule an appointment. Do this after dinner before bed. Called the Vampire hormone...only comes out in darkness. 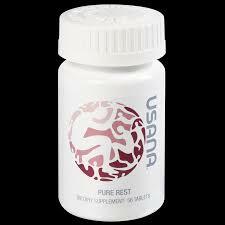 Dosage is key...USANAS Pure Rest take 1 mg tabs are serrated for easy dosage....take under the tongue for quick acting access...30-60 mins before bedtime.